Major investments need to be made in society’s utility supply lines; Water mains, sewage systems, telephone lines, power lines, gas mains, etc. Often the geographic location is recorded on inferior quality maps and in some cases it is not documented at all. Certainty of supply, environmental protection and efficiency of operations, however, require good basic data. Excavation damage can be largely avoided when reliable information regarding location and description of pipelines is available. Repair and replacement of pipes can be carried out in the optimal manner when based on an efficient information system. Flexible access to data retrieval and analysis. Location data i.e. geographic location of the utility transmission. Attribute data i.e. technical and administrative data regarding transmission lines, e.g. component type, size, age and ownership. The location should be surveyed and registered in relation to ground control points. It is thus possible to compare and present different types of transmission line data, base map data and other types of data such as information on cadastral ownership. It has been proven that it is cost-effective to build up a uniform and systematized register of information on public utility transmission lines. 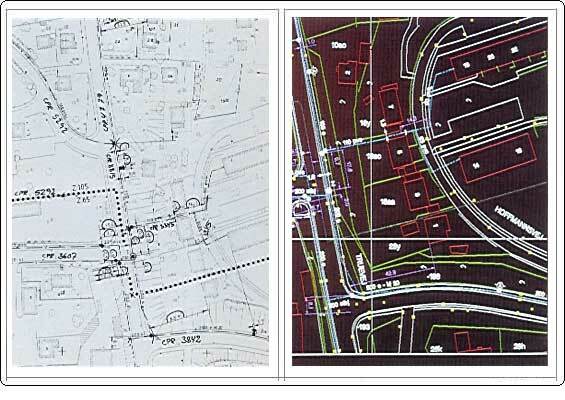 One of the advantages to a utility company, when employing a Consultant to carry out utility mapping, is that the bulk of work in connection with data capture can be carried out within a short period of time without staff increases or extra investments in equipment, thus easing the introduction of digital techniques.